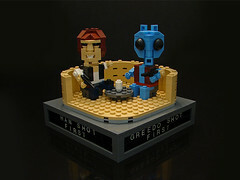 After having finally secured a set of the 2010 San Diego Comic Con and Star Wars Celebration V CubeDude sets, FBTB is finally ready to announce it's next building contest: CubeDude Vigs! And guess what: you're not just limited to a Star Wars-themed vig. You can build a vig from ANY licensed LEGO line, past and present. 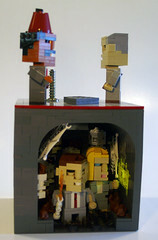 Build a vignette featuring 2-4 CubeDudes in a 16x16 stud area. This is a multi-CubeDude populated vignette building challenge. 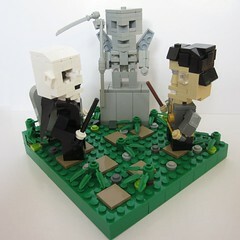 Meaning, you must have at least 2 CubeDudes and no more than 4 in your vignette. Your vignette must be contained within a 16x16 stud footprint with no overhang. 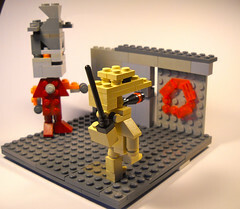 Your vignette can be from any licensed LEGO theme including Power Miners. Non-licensed, non-Power Miners themes will not be accepted. While there is no de facto standard on CubeDude construction, there are some commonly followed dimensions. Height is about 8-9 bricks tall. Feet/legs are generally 4 plates until they connect to hips. CubeDudes are 50% head and 50% body. If you need inspiration on construction there are several resources available on flickr. Angus MacLane, the father of the CubeDude movement, has a flickr set with every CubeDude he's ever made. 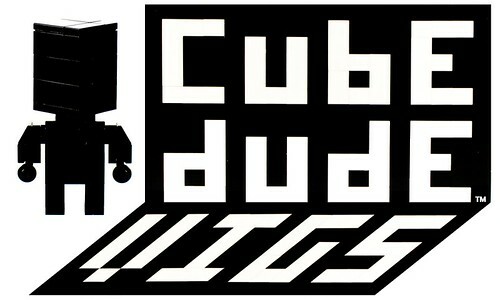 There is also the CubeDude flickr group. You can also do a general search for the term "CubeDude". Submit 1 picture as a reply to this thread. You may link to your flickr stream for more photos. 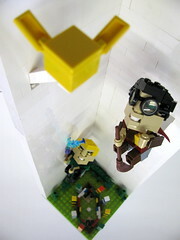 Add your photo to the FBTB: flickr Outpost photo pool with the tag "CubeDude Vig". You may submit as many pictures as you wish to the pool. 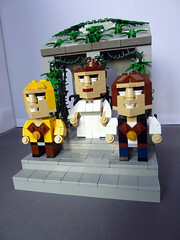 Real models using genuine LEGO elements accepted. Clone brand elements and computer renderings will not be accepted. No graphical enhancements allowed on the submission image. If your CubeDude design borrows heavily from another person's model, do the right thing and credit the source. Contest is open to registered members of the forum. Voting will occur in a single phase. The entry with the most votes will be declared the winner. This is a winner-takes-all contest. He/she will walk away with both the 2010 San Diego Comic Con LEGO CubeDude set and the Star Wars Celebration V CubeDude set. 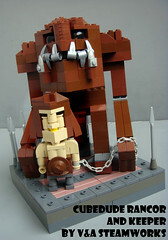 Thanks go out to Angus MacLane for the use of the CubeDude name for the contest. Sweet! I actually made a cube dud awhile ago, so I'll surely do this! One thing I'm not too sure about, though, is that the winner gets both sets. Doesn't really seam fair to the competition, ie if you get 2nd place, you get nothing. I assume mixing themes is allowed? E.g. one Harry Potter Dude and one Indiana Jones Dude together in the same vignette, or a Power Miner and Batman, or any other such combination. 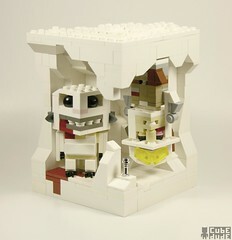 As long as there are 2-4 CubeDudes in the vignette and each is from a licensed theme (or Power Miners). ThatGuyWithTheBricks wrote: Sweet! I actually made a cube dud awhile ago, so I'll surely do this! One thing I'm not too sure about, though, is that the winner gets both sets. Doesn't really seam fair to the competition, ie if you get 2nd place, you get nothing. - well hell let's give out prizes for everyone then no matter how you do. - you know when you were you younger, or maybe for some of you, right now, you know when you go to some high schools and you go their gym and look up at all the championship banners they put up for winning their conference in whatever sport, like say volleyball or basketball? you know what you don't see? banners for coming in second. Gingerbeard Man wrote: I assume mixing themes is allowed? "Your vignette can be from any licensed LEGO theme including Power Miners. Non-licensed, non-Power Miners themes will not be accepted." the vignette as a whole must be a single theme and not a collection of themes. Those were still pretty darn snarky Ace. 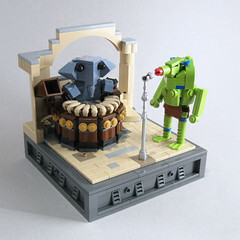 It seems the implication is that the cubedudes and vignette must be derived from an EXISTING (past or present) licensed theme, such as Star Wars, Spongebob, etc. But just to be sure: are hypothetical themes (that would obviously be licensed, if existent) allowed, such as LotR, Marvel Comics, etc.? were they? ugh. just having a bad day. sorry. MrCRskater wrote: It seems the implication is that the cubedudes and vignette must be derived from an EXISTING (past or present) licensed theme, such as Star Wars, Spongebob, etc. But just to be sure: are hypothetical themes (that would obviously be licensed, if existent) allowed, such as LotR, Marvel Comics, etc.? op wrote: You can build a vig from ANY licensed LEGO line, past and present. key word licensed, past tense, as in having already existed. The Power Miner's theme is FBTB's lovechild of a theme. We <3'ed it so much we created an April Fool's Joke event around it and even maintain a site theme around it (From Bombs To Boulders). So we decided to throw that into the mix as a vignette possibility. Power Miners is the one exception to the licensed rule, because Power Miners are AWESOME. Chief wrote: Power Miners is the one exception to the licensed rule, because Power Miners are AWESOME. yeah too bad that last wave sucked to high heaven. RIP Power Miners. Thou shall be missed. Cool Contest! i'll definitely try to enter! I have one question though, and I hope I wont be punished with a heap of snarky comments for asking it: Can we make CubeDudes of characters from our chosen license that have not been made into minifigs? Sweet! I've already practically finished my first dude and vig! It's something I've already done before.